I have recently discovered the many benefits to using OneNote at conferences. Recently I attended the #RareBirdsCon2016 in Sydney organised by Jo Burston and the Rare Birds Team. A great conference on being an #entrepreneur and a business owner. One of the main reasons was to support the #MicrosoftSMB team at this event. The #SurfaceRockStars team brought together by Digivizer was a real blessing during this two day event and the ideas were definitely flowing (and being captured in #OneNote on our devices). It was great to see the hashtag trend at Number 2 in Australia during this conference (due to a considerable number of live tweets using the #MicrosoftSMB hashtag). At conferences, I like to be flexible in how I take notes. Although I love handwriting, my brain can think much faster by typing (and of course tweeting). I was flipping backwards and forwards between using the typing keyboard on my #SurfacePro4 and drawing notes using the Surface like a pure ‘tablet’. My five top tips on how to use #OneNote at Conferences. Pre-set up your Notebook BEFORE you leave for the conference. Like with most things, I have discovered if you have a place for something, it is much easier to file. This also means setting up tabs such as in the image below. Most of my clients from Tech Coach HQ find it much easier once a system and process is set up, even for taking notes in meetings. I had already sent my flight and accommodation details into OneNote via Outlook (set it up via email) – a great link here. Pre-Conference: Connect with people on Twitter using the conference hashtag (such as #RarebirdsCon2016 or whatever the hashtag is. 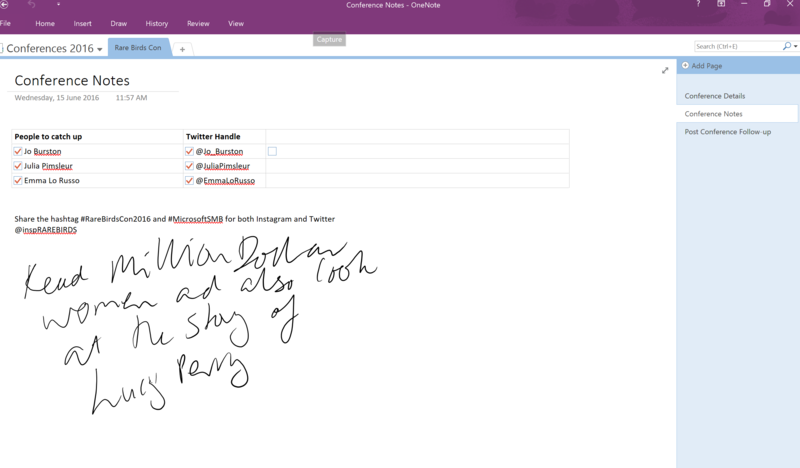 Have a list of people perhaps you would like to meet (and have that as a page in your OneNote Notebook). Tip 1: Where possible take images of slides: I just use my Surface Pro 4 camera (with the camera taking pictures of the main speaker’s screen) and then transfer them into OneNote. I also often will clip from a website to OneNote. (This will be a future blog post from Tech Coach HQ). As mentioned before, one of my most active apps that I use is ‘Snip’ to not only take screenshots but also annotate them before adding them into my OneNote Notebooks. Tip 2: Use the app ‘Office Lens’ available on iOS, Android and of course the Microsoft App Store for Mobile devices. This app will convert images into editable Word and Powerpoint documents (brilliant if you are sharing your knowledge with others in your business or team). 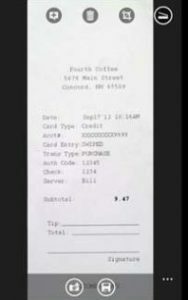 I have also used this app for taking photos of receipts and other expenses during a conference. Tip 3: Handouts – How many times at conferences have you been given printed material (and then have to travel home with it)? A great idea is to scan these handouts (that are relevant) and also business cards you have received. Tip 4: Share and Collaborate: The power of sharing your notebooks (just set up a particular notebook for covering the different sessions at the conference and then share out the link). Or you can export a particular page to a PDF or Word Document, so that everyone doesn’t have to see your ENTIRE notebook for that conference. Tip 5: The most obvious: Taking your notes. I have decided that I am definitely a tick a box person when it comes to remembering things to do. As a #SMB owner, there is always things that need to be done (in conference breaks) like following up phone calls etc. I had also set up a #MicrosoftSMB tag so that I could easily find my notes (even if they were handwritten) with this handy tag system. Stay tuned for more posts for #MicrosoftSMB as I help work out challenges for #SMB owners and those in the #entrepreneur community. As always, our motto at Tech Coach HQ is for #TechMadeSimple. If there are any questions that you would like answered, please feel free to reach out to our https://www.facebook.com/groups/techmadesimple group.